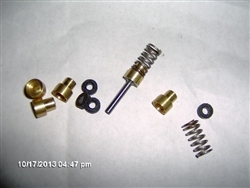 Crosman used the 111-026 spring in more models than it is practical to list. When the factory discontinued the spring we had to make it because it was the best spring for the MKI with the Mac1 Exhaust valve (used in the LD). We had a Stainless Steel Spring made to our specs that is the same tension and specs of the original but in a spring that cannot corrode. It is the perfect pump or CO2 valve spring where corrosion can be terminal. Stem and seal not included. Made in USA by Mac1.